Washington, D.C. – Today, the Consumer Federation of America (CFA) released research showing that large auto insurers frequently fail to reward drivers with low mileage despite a strong relationship between this mileage and insurance claims. In fact, three of the five largest insurers often give low-mileage drivers no break at all. In a 2012 nationwide survey conducted by ORC International for CFA, 61 percent of respondents said that it was fair for auto insurers to use mileage in pricing auto insurance. “The failure of most large insurers to adequately reward low mileage especially harms lower income and older drivers because they drive the least,” said Stephen Brobeck, CFA’s Executive Director. “This lack of concern for mileage, along with an emphasis on other non-driving factors such as occupation and income, help explain why insurers charge many lower income drivers such high prices for minimal, state-required liability coverage,” he added. “If insurers were to properly reward consumers for less driving, that would not only lessen their auto insurance costs, but also reduce the number of uninsured motorists, accidents, air pollution, and the impact on global warming,” noted J. Robert Hunter, CFA’s Director of Insurance and former Texas insurance commissioner. Using the websites of the nation’s five largest auto insurers – State Farm, Allstate, Progressive, GEICO, and Farmers – CFA priced minimum, state-required liability coverage in ten cities for a 30-year old single woman with a perfect driving record – no accidents or moving violations ever. This woman was a bank teller with a high school degree who rents a house in a moderate income ZIP Code (c. $30,000 median annual income) and drives a 2005 Honda Civic. CFA compared prices quoted to this driver for both 5,000 and 20,000 miles driven per year. 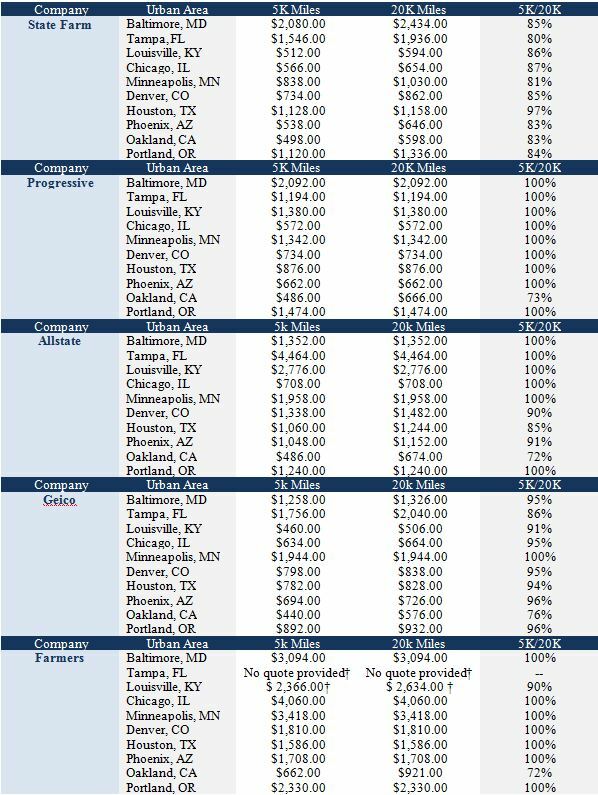 As can be seen in the appended table, except in California, which requires auto insurers to use miles driven as a rating factor, three of the five insurers – Farmers, Progressive, and Allstate – often or always quoted the same annual premium for 5,000 and 20,000 miles driven annually. In most cases, Farmers and Progressive did not even ask consumers for their annual, estimated mileage in preparing the quotes. State Farm is the only major insurer that consistently rewards drivers for low mileage. All careful studies show a strong relationship between mileage and insurance claims (though losses do not increase as rapidly as miles driven, in part because there are fewer accidents per mile driven on highways than on other streets and roads). One of the most recent and authoritative studies was released in 2009 by Quality Planning, a company providing data to auto insurers. Its research, based on about 500,000 insurance policies, found that the lowest annual mileage group (0-3,000 miles) had 44 percent fewer claims than the average, while the highest annual mileage group (more than 20,000 miles) had 28 percent more claims. A recent study undertaken by three academics – “The Use of Annual Mileage as a Rating Variable” by Jean Lemaire, Sojung Park, and Kili Wang in a 2012 Wharton School Working Paper – concluded that “annual mileage is an extremely powerful predictor of the number of claims at-fault.” In an analysis of nearly three million car years based on 2006 data from the Massachusetts Commonwealth Automobile Reinsurer, MIT’s Joseph Ferreira and Eric Minikel learned that an increase in annual mileage from 10,000 to 30,000 increased claim frequency by 60 percent and claim costs by 43 percent. And, in a study matching mileage readings collected during emission checks in the Vancouver area with insurance claims records for more than 500,000 vehicle-years, Todd Litman of the Victoria Transport Policy Institute found that increasing mileage from less than 5,000 kilometers/year to 20,000-25,000 km/year doubled crash rates. These income-related mileage differences are reaffirmed by the few surveys linking household income to miles driven. A 1997 paper by Elaine Murakami and Jennifer Young, based on the 1995 National Personal Transportation Survey, found that the 11 percent of drivers with low incomes drove far fewer miles than drivers with higher incomes – 4,654 miles/year vs. 9,627 miles/year. And research by Jeffery Memmott published in 2007, and based on the 2001 National Household Travel Survey, showed that lower income households take fewer personal vehicle trips that average fewer miles than those taken by higher income households. “The high annual premiums for low mileage revealed by our research suggest that low- and moderate-income drivers are greatly harmed by the refusal of many insurers to reward this low mileage,” noted CFA’s Brobeck. Some insurers, including Progressive, which promotes its Snapshot program, have argued that the only way they can accurately determine mileage is by installing devices or using built-in telematics service. This technology, which can measure not only miles driven but also factors like speed and hard braking, does offer the possibility of much more accurate driver risk assessment and driver feedback that can motivate safer driving. On the other hand, it is relatively expensive, not available for old cars, and has been the subject of driver complaints, for example, penalties for hard braking that encourage the running of yellow lights and other dangerous driver behavior. Moreover, some drivers do not wish insurers to have all this information, including the ability to track where they drive and at what time. In the past, insurers have confirmed the accuracy of mileage estimates by recording odometer readings at the times of policy purchase, policy renewal, and accident claims. These readings can be taken not only by company agents, but also by third parties such as auto repair shops. In fact, CARFAX maintains a database on the odometer readings of tens of millions of vehicles, which is based on information from more than 90,000 sources – departments of motor vehicles, police and fire departments, rental car companies, and auto repair shops. Those states requiring periodic safety and/or emission inspections represent an especially useful source of odometer readings. All these sources can be used to check and, if necessary, correct driver estimates. carefully checking on factors like education and occupation that they are increasingly using in their rate-making?” he added. As our price survey suggests, few states require, or even encourage, insurance companies to emphasize the number of miles driven in pricing auto insurance. One notable exception, as shown in our survey, is California, which requires auto insurers to treat annual miles driven as the second most important factor in pricing (driving safety record is first). The ORC International survey of 1,010 representative adult Americans was conducted in June, 2012, by cellphone and landline. Its margin of error was plus or minus three percentage points. The Consumer Federation of America is an association of more than 250 nonprofit consumer groups that was established in 1968 to advance the consumer interest through research, advocacy, and education. CFA researcher Michelle Styczynski collected price data for this research. Appendix A. Annual premiums for minimum liability coverage charged to a typical moderate-income person* who drives 5,000 and 20,000 miles per year.